Before Maria was born I tried to cope with morning sickness by focusing on engrossing activities, like quilting and crochet. Quilting I have sufficient experience with to be successful. And as for crochet, well I took lessons as a five year old, and then many years later I made Geoff a ridiculously long, lanky "I have a crush on you" scarf. 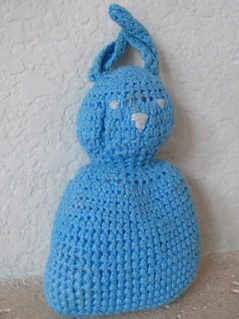 In spite of limited experience I was determined to make something or anything for the baby, and what came of that ambition is Blue Bumby, Maria's bunny doll. I just kept going 'round until it started to look like something. 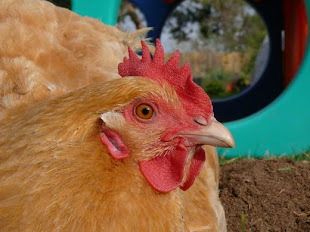 She loves it, which you can tell by it's scruffy appearance. While unpacking yet another box, I came across a just in case present I bought to keep on hand... well, just in case I needed a gift for someone. 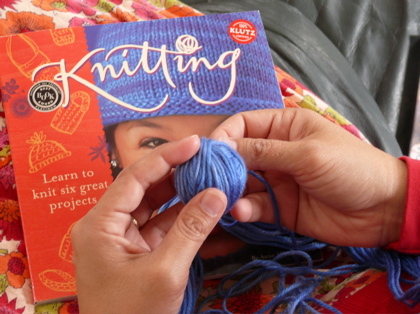 It's a Knitting instruction kit from Klutz. It kept calling me to play with it, and I kept denying myself the freedom to play. Who can explain my timing? This is a hectic and challenging time in our lives, and it makes no sense for me to break open a new toy and start playing. Oh well. Here I go! 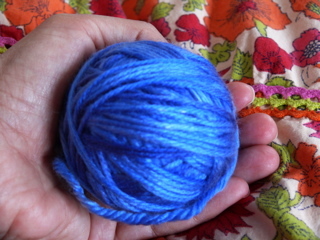 The first direction is to take the skein and turn it in to a ball. Simple, huh? It's the perfect meditative task for me. Sufficiently challenging, yet calming. Possibly Klutz gave me cheap yarn. It started tangled, and was a little frustrating. I enjoyed being able to unravel a mess without help from attorneys, or counseling. I love the colors. The blue lightens and deepens. It has movement. Speaking of movement... Maria caught sight of my little project and picked up the finished ball of yarn saying, "Oh ball! Perty, perty. Here you go Benby!" And she threw it across the floor. Benjamin was thrilled to have a new toy unraveling across the carpet. 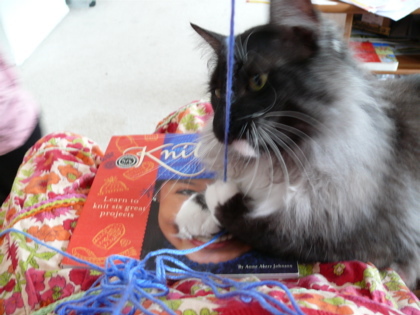 Cats and yarn. It's Cliché, isn't it? How can something be cute and annoying at the same time? 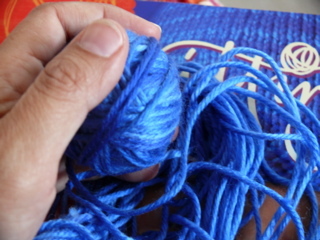 Now I have three balls of bright blue yarn, ready and rolling to become project one of the Klutz handbook.